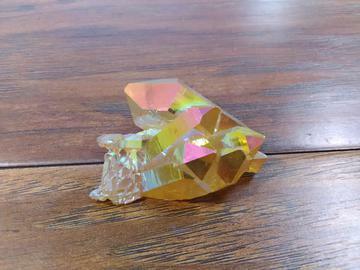 Sunshine Aura Quartz is a gemstone that brings the power of the metaphysical solar energy of the Sun into your life. It is a powerful healing stone that sends rays of recharging beauty through your 3 bodies. It helps bring you clarity and wisdom in your personal life as well as shining new light on your metaphysical path. You will find it is a protective and stimulating gemstone that opens your eyes and alleviates the sting of disappointment, anxiety and stress. This stone will breathe new life into the tedious nature of daily routine. Sunshine Aura has been bonded with Iron.